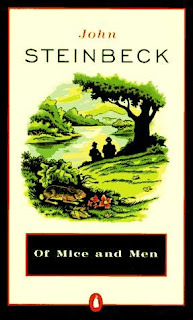 A Literary Odyssey: Book 43: Of Mice and Men and Book Stats. I have read one other Steinbeck in this process so far. Book 15 was Travels with Charley in Search of America and I really fell in love with it. I will also be reading The Grapes of Wrath and The Winter of our Discontent. These four titles are my first exposure to Steinbeck. I somehow made it through high school and college without reading any of his large pieces of work. I have read snippets before, but never a complete novel. This novel(la) is commonly taught in schools, and was taught in my own high school. 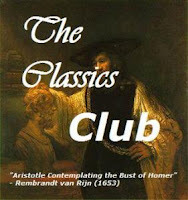 For some reason, I was never in a class that was required to read it. We were given the option in tenth grade to pick the books we were going to read off of a list of required reading. Then in eleventh and twelfth grade, I picked some of the lesser-taken English electives (mystery/sci-fi, Shakespeare, Creative Writing), rather than go for American or British literature. It is funny how things work out that way. In any case, I am looking forward to my second go with Mr. Steinbeck, and I am hoping I love it just as much as I loved Travels with Charley. I am also reading this to fulfill the rest of the LOST books challenge, so seeing correlations there with also be a highlight. I just thought I would let you know that I was studying for my English teaching certification exam today and I came across a question that I could only answer because of reading your blog. It made me smile. It was about Crime and Punishment, something I knew very little about beforehand. Will have to read this next year. I should read this at some point too. 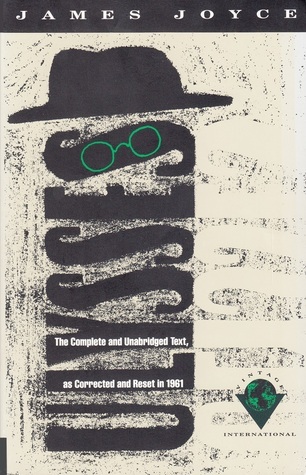 So far, my only book of his read is East of Eden, but I own Grapes of Wrath to read. It was taught at my school in cambridge (UK) - but I think that my class did something else, and I read it later. Really enjoyed as I remember! I have an award for you at my blog, please stop by and pick it up! Travel with Charley is still my absolute favorite Steinbeck book. I've read most of his big ones (East of Eden, Grapes of Wrath, Of Mice and Men, The Pearl, Cannery Row, etc.) but nothing has come close to how much I loved Charley.